The Orbit model 57196 irrigation controller is connected to water valves that are connected to underground sprinklers to create an irrigation system. When the controller is activated, the appointed water valves open and cause the sprinklers to pop up and water the lawn. The 57196 controls the schedule over each water valve and its sprinklers. 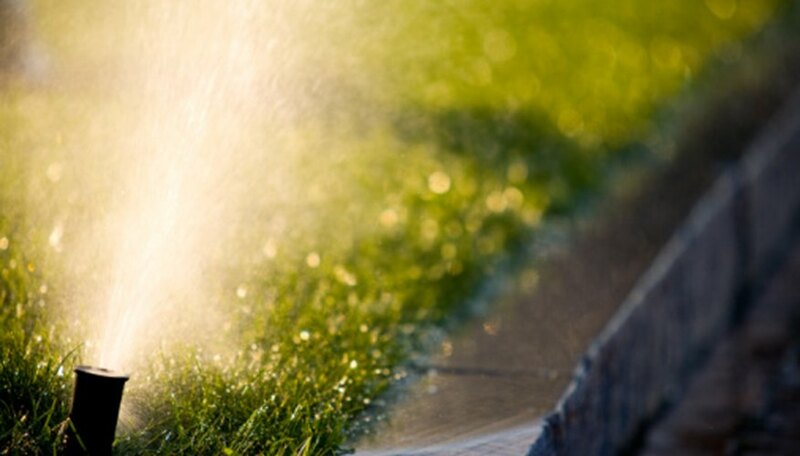 After the system is installed, you might have questions about how to program the controller and get started watering your lawn. Insert a small, thin object, such as a pen tip or paper clip, into the "Reset" hole located to the right of the display at the top of the controller face to reset the settings. The reset function clears the controller of all previous settings and restores the factory settings. Twist the dial in the center of the 57196 to the "Time/Date" position to set the current time, day, month and year. The time flashes on the display. Press the "+" and "-" buttons located to the right of the dial to set the current time and press "Enter," which is located at the bottom right of the controller, to save the set time and advance to the day setting. Repeat the process for day, month and year. Twist the dial to "Start Times" located on the right side of the dial to set up watering start times for the sprinklers. The display shows an empty time slot and a blinking cursor. Use the "-" and "+" buttons to set the desired start time and press "Enter." You can add up to three additional start times if you enter another start time at this point and press "Enter" again. Twist the 57196 controller dial to "Station Duration" located on the right side of the dial to set a watering duration time. A blank minute place appears in the display. Press the "+" and "-" buttons, until you arrive at the desired duration time, and then press "Enter" to save it. Select a time anywhere between one to 99 minutes. Repeat the process to specify different duration times for the remaining stations or leave it as is to specify the same watering duration for every station. Twist the dial to the "Day of Week" position located on the lower-right side of the dial to set the desired watering days. The days of the week appear on the display. Press the "Next" button located on the left side of the controller beneath the "Clear" button to advance to and highlight the days you desire. To select days, press the "Enter" button once they're highlighted. The 57196 activates on each selected day and you can select as many days as you like. Twist the dial to the "Auto" position located at the topmost point of the dial to enable the 57196 and run the scheduled program.